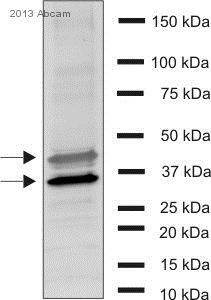 Rabbit polyclonal Glutamine Synthetase antibody. Validated in WB, IHC, ICC/IF and tested in Mouse, Rat, Dog, Human, Common marmoset. Cited in 25 publication(s). Independently reviewed in 11 review(s). Synthetic peptide corresponding to Mouse Glutamine Synthetase aa 1-100 conjugated to keyhole limpet haemocyanin. WB: Mouse kidney, mouse liver, rat liver, human brain, mouse brain, rat lung and mouse pancreas (data not shown) tissue lysates. ICC/IF: MEF1 cell line. Our Abpromise guarantee covers the use of ab73593 in the following tested applications. WB Use a concentration of 1 µg/ml. Detects a band of approximately 42 kDa (predicted molecular weight: 42 kDa).Can be blocked with Mouse Glutamine Synthetase peptide (ab73592). This enzyme has 2 functions: it catalyzes the production of glutamine and 4-aminobutanoate (gamma-aminobutyric acid, GABA), the latter in a pyridoxal phosphate-independent manner (By similarity). Essential for proliferation of fetal skin fibroblasts. Defects in GLUL are the cause of congenital systemic glutamine deficiency (CSGD) [MIM:610015]. CSGD is a rare developmental disorder with severe brain malformation resulting in multi-organ failure and neonatal death. Glutamine is largely absent from affected patients serum, urine and cerebrospinal fluid. Belongs to the glutamine synthetase family. Expressed during early fetal stages. 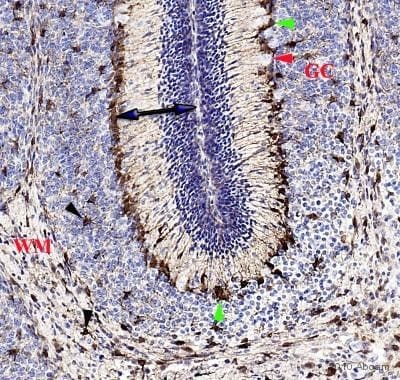 Immunohistochemistical detection of Glutamine Synthetase on Formaldehyde-fixed paraffin-embedded rat brain sections using Glutamine Synthetase antibody (ab73593). Antigen retrieval step: Heat mediated - Buffer/Enzyme Used: Citric acid pH6 Permeabilization. Blocking: 1% BSA for 10 mins at room temperature. Primary Antibody Dilution 1/1000. Incubation time: 2 hours in TBS/BSA/azide. 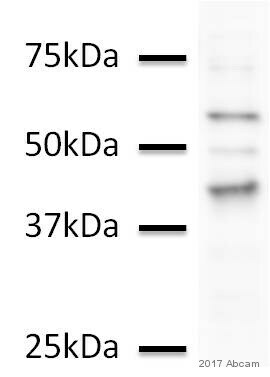 Secondary Antibody: anti Rabbit IgG Conjugated to biotin (1/200). In the submitted image of rat cerebellum, two very good examples are observed of the bulbous endfeet of the primary Bergmann glia primary processes connecting with the inner Pial membrane. 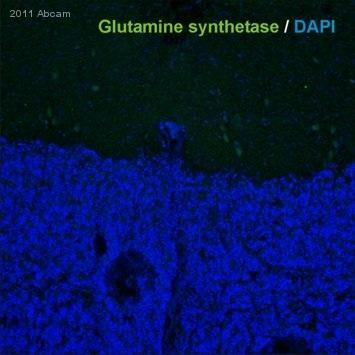 ab73593 staining Glutamine Synthetase in MEF1 cells. The cells were fixed with 100% methanol (5 min), permeabilized with 0.1% Triton X-100 for 5 minutes and then blocked with 1% BSA/10% normal goat serum/0.3M glycine in 0.1% PBS-Tween for 1h. 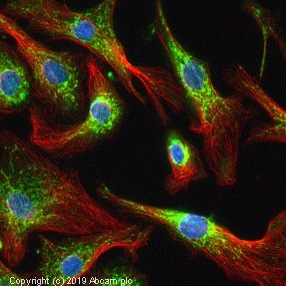 The cells were then incubated overnight at +4°C with ab73593 at 5ugml then detected with an Alexa Fluor® 488 goat anti-rabbit secondary antibody (ab150081) at a 1/1000 dilution (shown in green). Nuclear DNA was labelled with DAPI (shown in blue), and ab195889, Mouse monoclonal to alpha Tubulin (Alexa Fluor® 594), at a 1/250 dilution (shown in red). 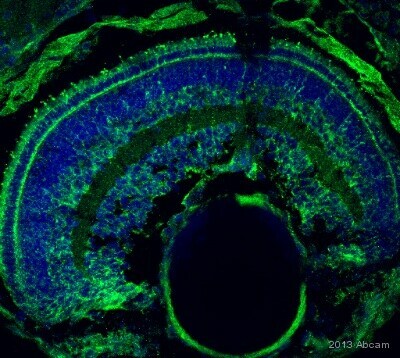 IHC-FoFr image of Glutamine Synthetase (ab73593) staining on Rat hippocampus sections. The sections used came from animals perfused fixed with Paraformaldehyde 4%, in phosphate buffer 0.2M. Following postfixation in the same fixative overnight, the brains were cryoprotected in sucrose 30% overnight. Brains were then cut using a cryostat and the immunostainings were performed using the ‘free floating’ technique. Publishing research using ab73593? Please let us know so that we can cite the reference in this datasheet. We have done work with your antibody Glutamine Synthetase 73593 and I was curious to know if it has an expiration date? We store the antibody in a -20°C freezer but I would like to know how long it would last in storage. Also it does say to store at -20° or -80°C, is one preferable to the other? We do not have set expiration dates for our products. Most antibodies are stable and can last for anywhere from a few months to several years if stored properly, so we strongly recommend that you follow the storage instructions on the datasheet for the antibody you purchased. These conditions will vary among our antibodies, therefore, it is important to verify the storage conditions for each of our products when you receive them. We guarantee all of our products to work for at least 6 months from the date of purchase when stored correctly. For ab73593, we recommend storing at either -20C or -80C and at these temperatures the antibody could be viable up to 5 - 10 years. For more information on antibody storage and stability, please visit our Antibody Storage Guide on our Protocols and Troubleshooting Tips page (https://www.abcam.com/index.html?pageconfig=popular_protocols). I hope this information helps. Please do not hesitate to contact us if you need anything further. 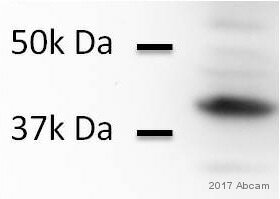 Phone call requesting information on how western blot presented on the datasheet of Anti-Glutamine Synthetase antibody (ab73593) was performed. Thank you for contacting us in regards to anti-Glutamine Synthetase antibody (ab73593). I now have confirmation form the lab of how the Western blot presented on the datasheet for this antibody was performed. 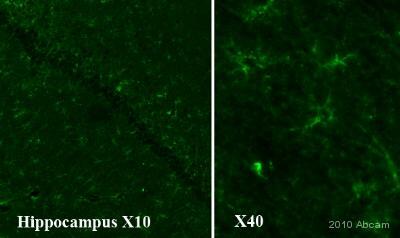 We used 10 ug of the different tissue lysates with 1 ug/ml of primary antibody. The membrane wasblocked for 1 hour at room temperature with 5% BSA in 0.1% TBST, with gentle rocking.Theprimary antibody wasdiluted with 5% BSA in 0.1% TBST and incubated overnight at 4°C with gentle rocking. I hope this information has been of help.If you have any problems in using thisantibody in westernblotting pleasedo let us know, or if you require any further information please do not hesitate to contact us again.